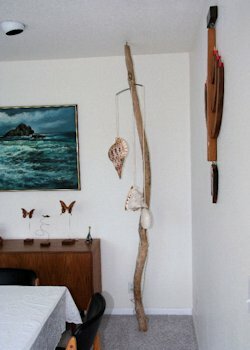 This Pole Lamp came from an Oregon Beach. Bernice and I had been looking for a suitable pole for a lamp. One day we had driven out on Cannon Beach with tour two sons just for fun. Because people can drive out on the beach at Cannon Beach, you cannot find driftwood on the sand. When we stopped to get out this piece caught my eye as it laid just outside my door. Didn't seem right to get it so easy but there it lay. The Conch shell and the Chambered Nautilus we bought at Fisherman's Wharf in San Francisco.